Ideal for treating water for coffee and coffee machines. 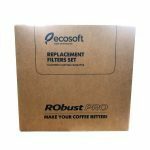 RObust PRO is a unique reverse osmosis water filter for real coffee professionals and connoisseurs. 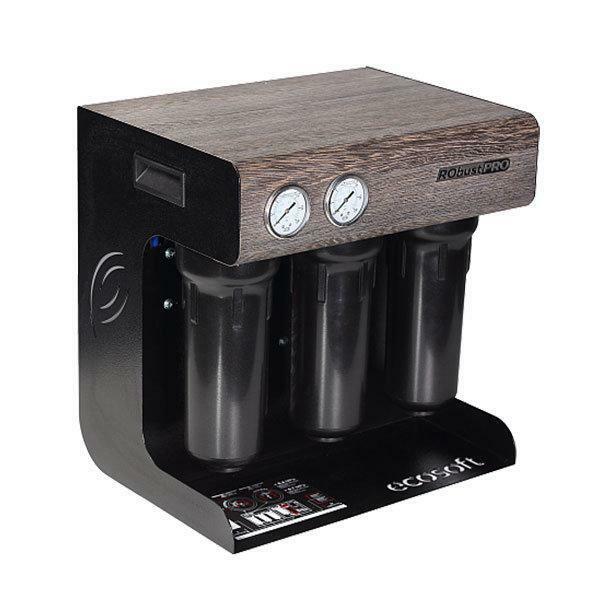 The filter is designed taking into account the world’s “coffee” standards and allows to get water that perfectly reveals the inimitable coffee taste. Ideal for water for drinking and cooking/Water for coffee and coffee machines. Designed especially to feed commercial coffee machines. An extra cartridge delivers a special blend of Calcium & Magnesium to the purified water in order to give the best tasting coffee. Using a multi-stage water purification technology ensures the availability of tasty water for drinking and making coffee, also guarantees the protection of the coffee machine from scale and other contaminants. Reverse osmosis is the most advanced technology of water purification. Thanks to a special semipermeable membrane it is possible to efficiently purify drinking water from virtually all harmful impurities, including bacteria and viruses. The pores of this membrane are 200 times smaller than the viruses, and 4000 times smaller than the bacteria. The high-pressure pump supplies water to the membrane and to a special replacement filter at the same time. The membrane provides highly-efficient water purification at the molecular level. The special replacement filter saturates the water with Ca and Mg, providing a wealth of coffee taste and aroma. As a result, the content of Ca and Mg as well as other water quality indicators comply with the recommendations of the SCAA (Speciality Coffee Association of America). The RObust PRO filter is equipped with a dry-running pump protection function. If the supply of feed water is cut off or the inlet pressure drops below 0.4 bar, a low-pressure switch trigger that closes the valve and turns off the pump: even if the purified water tap is opened, the filter will not start until the supply of fresh water with sufficient pressure is restored. On the front panel of RObust PRO, there are two pressure gauges, one of which displays the inlet water pressure after the pre-filters, and the second – the pressure after the pump in the membrane unit. In addition, for user convenience, the special information label shows recommended pressure values for pressure gauge and recommendations for resolving possible problems if these values do not correspond to those required. If the pressure after the replacement filters is less than 1 bar, this may indicate its contamination. Procrastination with the change of replacement filters can lead to damage or destruction of the membrane. The pre-filters should be changed after treatment of 8000 liters of water, but at least every 3 months. The resource depends on the consumption and quality of the purified water. If the filtration rate drops significantly, reverse osmosis membranes must be replaced. To obtain purified water of unchanged quality, we recommend replacing reverse osmosis membranes after treatment of 24000 liters of water, but at least once a year. In the event of long breaks in the filter operations (more than 2 weeks), it is necessary to disinfect the filter (the procedure is described in details in the manual). If the taste of purified water deteriorate significantly or an unpleasant odor appears, it is recommended to replace the carbon post-filter. The post-filter should be changed after treatment of 8000 liters of water, but at least every 3 months.